PC gamers have been waiting for months on end to see GPU prices fall back to at least their recommended retail price, and it looks as though that might finally be starting to happen. With the prices of cryptocurrencies receding from record highs, demand for GPUs has finally dropped off. Coupled with the impending refresh of Nvidia's GPU line, prices are now back to affordable levels. As spotted by PC World, Amazon is currently selling a Gigabyte Radeon RX 580 4GB GDDR5 GPU for US$210. This is down from US$300 courtesy of an upfront US$90 discount and a US$20 mail-in rebate. A factory AMD Radeon RX 580 originally retailed for US$200, but didn't include the custom dual-fan cooling solution fitted to this Gigabyte variant. 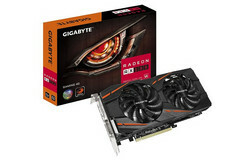 Even now, sites are still listing this card for US$270, showing there is still room for GPU prices to drop further still. PC World also spotted another deal for an ASRock Radeon RX 580 8GB GDDR5 bundled with a US$90 ASRock AB350 Pro4 motherboard for a total of US$300. Normally the card alone retails for that price making it a particularly attractive deal if you are looking to give your PC an upgrade. The MB is also compatible with AMD's second-generation Ryzen chips, so it has some longevity built-in. The deal is still live on Newegg at the time of writing.